Do you face uncertainty in your life? How do you manage them? Last Friday, I was out with a friend. During our conversation, we talked about his upcoming job, which is supposed to start at the end of the month. He shared with me some uncertainty surrounding the job. Apparently, he and his potential employer have yet to agree on one important job item — his pay. While they had proposed a starting pay, my friend felt that it was too low and requested for a higher figure. This is highly important to him, to the extent that he will reject the job if they cannot meet his request. His potential employer said that they would revert to him in time. While my friend waits for their reply, he feels like he’s in limbo, because he can’t make any plans until they revert to their decision. On one hand, they will probably agree since it is a reasonable amount. On the other hand, they may say no because they have the bargaining power. Whether you like it or not, there are times in our life when we have to face uncertainty. My friend’s situation is one of the many examples of uncertainty in life. After I graduated from junior college, I had to select my university course, and I only had a short period to make the decision. It was a big decision that would affect my career path, so it was crucial to make the right selection. However, since I had little knowledge of the courses and little real-life experience at that point, I felt very uncertain about which course to take. It was unnerving to make such a huge decision at such a young age, in such a short time period. When I was working in my previous job, there was a point when I wanted to change job assignments to gain exposure to a different business unit. The bureaucracy of a large organization meant that I had to wait for months before it would happen. I felt great uncertainty as it was unclear when the move would happen. When I quit my job to start my coaching business, I faced the most uncertainty that I had ever faced up until that point. Not only was I uncertain about when my business would take off, but I didn’t know when I would start earning money (my income was zero since it was a new business). I was also concerned that my business might never succeed. In each instance, I learned to manage the uncertainty rather than let it overwhelm me. In the end, I pushed through the obstacles and turned each problem around, eventually achieving my goal. If you are currently facing uncertainty, don’t fret. 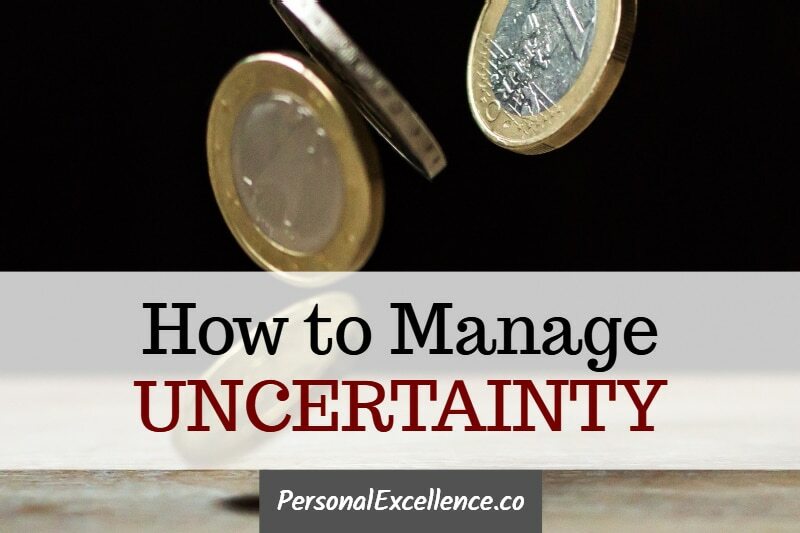 Uncertainty can be managed by taking the right approach. Here are my three best methods to manage it. First, focus on the things you can control while ignoring those that you can’t. In every situation you are in, there are always factors that you can control and factors that you can’t. What factors can you control? Focus on them. What are the factors that you can’t control? Do what you can to influence them, but don’t obsess over them. My goal was to focus on the things I could control, such as my business strategy, building my skills, creating the best content, and getting clients. For the other things that I couldn’t fully control — such as whether the media would interview me and whether my articles would be #1 on Google — I would do my best but not worry about them. PE soon gained traction and the rest was history. This was possible because I focused on what I could do, rather than get distracted by other things. I was never worried about whether X or Y would happen. I was always busy working every day on everything within my locus of control, which in turn created quick results. You want to shift from an external locus of control to an internal locus of control. An external locus of control means you perceive the environment to have more control than you over your life. For example, if you feel that the economy, the government, and other people have more control than you over your happiness and success in life, you have an external locus of control. An internal locus of control means you perceive yourself to have more control than the environment over your life. For example, if you see that you are fully responsible for your happiness and success, you have an internal locus of control. People with an internal locus of control tend to be happier and more proactive than people with an external locus of control. That’s because they are able to deal with uncertainty and life problems readily. If you’re facing uncertainty, bring certainty to the situation by focusing on the things you can control. Work on them. As for the other things you can’t control, do what you can to influence them, but don’t obsess about them. Focus on action, not worrying. The second method is to live your life as you would normally, independent of the uncertainty. Ask yourself: “What would I do if this situation/problem did not exist in my life?” Then, do that. My friend’s unconfirmed job situation reminded me of a client I coached a year ago. My client was a very successful business consultant with his own investment company. Apart from managing his company, he was consulting part time with a very famous global tech firm (let’s call it Firm X), with the potential to be converted to full time after six months. The job, if offered, would be a high profile role with a big paycheck. It would be a once-in-a-lifetime opportunity. As my client neared the end of the stint, he felt apprehensive as the founders did not indicate any interest in hiring him long term. Despite his effort to get face time with them, the meeting kept getting postponed due to their busy schedules. Hence the dilemma: What should my client do? Should he keep following up until he receives an answer on the job offer? However, he might come across too pushy, which might jeopardize his chances of being selected. Should he just wait for the founders to revert to the decision? But what if they never do? Would that be the end of his relationship with this firm? The uncertainty bothered my client a lot as he really wanted the job, to the point where he had put his personal plans on hold, in anticipation that he would get the job. So when the job offer became uncertain, it threw his life off balance. As my client worked on his personal goals, the uncertainty with the job offer stopped bothering him. While he still did not receive any updates with regards to the pending job offer, he was at peace with the situation. After a couple of weeks, as fate would have it, he was offered a full-time job with Firm X with a great pay package. In every situation, there are always things that are important to you and other things that are less important. The third method is to bring certainty to the important things and let the other less important things go. Since the latter items are not so important, it wouldn’t really matter what comes out of them. Let’s say you have just moved to a new country. You are unemployed. You have no friends here. You have no income since you are unemployed. You have no fixed accommodation and you are merely living at a hostel at the moment. Your savings can only last you for another week. Your life is in a flux and everything is up in the air. In the face of such great uncertainty, you should focus on stabilizing the most important areas of your life. For most people, these would be financial security and getting a fixed accommodation. For financial security, you can secure your finances first by doing some quick, odd jobs. You can also borrow money from your friends back home and return it once you get a job. The objective is to tide you over for the short term while you figure out what you want to do in the long term. You can take your time to look for a job that matches your aspirations once your short-term financial issues are addressed. With your finances in place, you can look for an accommodation. Check the classifieds, search Google, or approach the hostel owners for help. Dedicate a couple of weeks for apartment hunting and don’t stop until you find a place that meets your needs. During this period, don’t worry about other things. While not exactly similar to the example above, I once traveled for 7 months through Europe and the United States. The whole travel was filled with uncertainty at every point. Throughout the 7 months, I was traveling without a specific agenda. I would move from one place to another when the situation called for it, such as when I was invited for a work engagement, when a reader or client offered to host me, or when I felt that I was ready to move on. I could be in Amsterdam today, with no plans on what I was doing next week, and suddenly depart for London via the next train. I could be in London, with the intention to stay there for six months, and suddenly book a flight to Philadelphia the next week because I was invited to speak at a conference there. Because of that, I rarely knew which country or city I would be in the next week, much less my exact accommodation. How did I manage such day-to-day uncertainty? I did it by focusing on the most important thing(s) at that moment, and only that. This meant that if my key concern at that moment was getting an accommodation, I would focus my energy on finding a decent accommodation that met my needs. If my key concern was getting to the next location safely, I would figure out how to do that and not worry about anything else. As for the other things, I would not concern myself with them until my immediate concerns were addressed. Of course, I was always working along the way. By adopting this approach, my seven-month travel was a lot of fun despite the day-to-day uncertainty. I was able to foster lots of amazing friendships, see great sites, immerse in each country’s culture, and cover many countries and cities in great depth, without feeling apprehensive about the trip itself. I hope you have found my three methods of managing uncertainty useful. At the end of the day, uncertainty isn’t a bad thing. Some of you may find uncertainty unnerving and resist it. However, I’ve learned that uncertainty is a natural part of life. Change is the constant today. When we resist change, we stay stagnant, and when we are stagnant, we are dead. We cannot innovate, we cannot change, and we cannot create in a meaningful way. It is through uncertainty that our character gets molded, and we learn some of our best lessons. As I’ve shared before, fear, uncertainty, and discomfort are your compasses toward growth. While you manage uncertainty, know that it’s not something to resist. Instead, focus on living in the present while tackling the obstacles. Work through whatever is hindering you, but don’t let this affect your experience in life. You can’t change the cards that life deals with you, but you can change how you react to them.